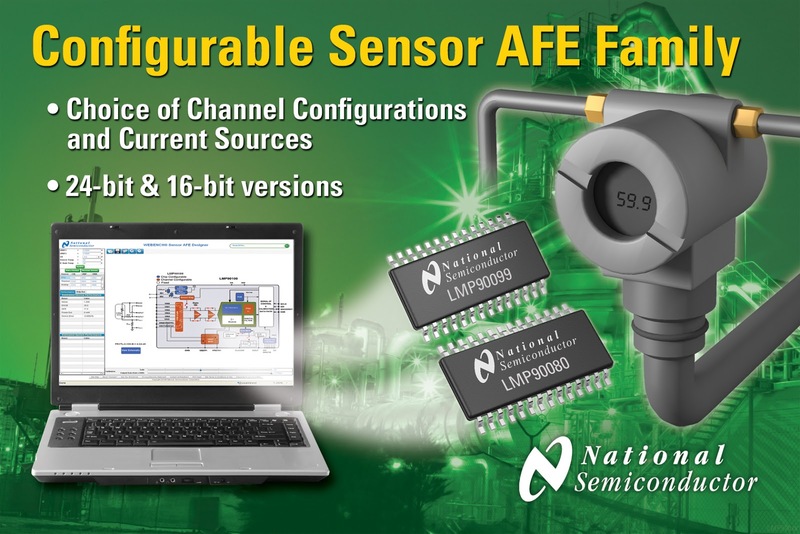 National Semiconductor has announced 7 new sensor AFEs, in 24-bit and 16-bit configurations. 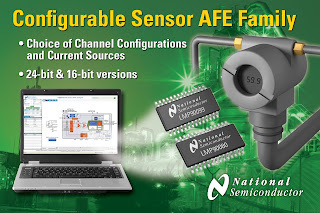 National Semiconductor Corp. has announced the availability of seven new 24-bit and 16-bit multi-channel sensor AFEs (analog front-ends). National has designed the LMP900xx series sensor AFEs to enable designers to easilly configure signal paths from interface sensors to microcontrollers. You can use the AFEs for precision sensing systems to monitor and control temperature, pressure, load, force, motion/position and voltage in industrial, medical, and test and measurement applications. To ease the design process, National has developed the WEBENCH® Sensor AFE Designer software tool and bench-top development system. Designers can use WEBENCH to model attaching a sensor and configuration of the signal path, optimize their design, and download the configuration data for the sensor AFE for immediate prototyping. National has developed WEBENCH design kits for engineers to use with a variety of the company's products, and the WEBENCH FPGA Power Architect won EDN Magazine's Innovation Award in the Software Category earlier this year. The LMP900xx is a pin-compatible family of products that include either a 24-bit or 16-bit sigma-delta ADC, with a programmable input MUX (multiplexer) that designers can use to interface up to 4-differential inputs, or seven single-ended inputs in any combination of input types. You can utilize the microcontroller interface by connecting through a standard 4-wire SPI (serial peripheral interface) which also provides CRC (cyclic redundancy check) data link error correction. Seven general purpose I/O ports are also available, and each IC is guaranteed over the -40 degrees C to 125 degrees C temperature range. The LMP900xx IC’s incorporate background calibration at all gain setting (1, 2, 4, 8, 16, 32, 64 and 128) to eliminate offset and gain drift over time and temperature without disturbing the measured signal. You can configure each channel independently for gain and sample rate, with automatic, manual and single scan of selected channels. Continuous background sensor diagnostics are also provided for detecting shorts, opens and out-of-range signals. The LMP90099 provides 24-bit resolution, 4-differential and 7-single-ended inputs without current sources. The LMP90098 provides 24-bit resolution, 2-differential and 4-single-ended inputs with two matched current sources. The LMP90097 provides 24-bit resolution, 2-differential and 4-single-ended inputs without current sources. The LMP90080 provides 16-bit resolution, 4-differential and 7-single-ended inputs with two matched current sources. The LMP90079 provides 16-bit resolution, 4-differential and 7-single-ended inputs without current sources. The LMP90078 provides 16-bit resolution, 2-differential and 4-single-ended inputs with two matched current sources. The LMP90077 provides 16-bit resolution, 2-differential and 4-single-ended inputs without current sources. 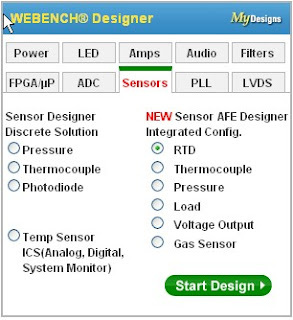 More information about National’s sensor AFEs, WEBENCH Sensor AFE Designer and development system is available at http://www.national.com/sensorAFE. Offered in 28-pin TSSOP packages, National’s LMP900xx sensor AFE ICs are available now and range in cost from $3.25 to $4.95 in 1,000-unit quantities. For more information on the LMP90099/98/97 24-bit sensor AFEs or to order samples and an evaluation board, visit http://www.national.com/pf/LM/LMP90100.html. For more information on the LMP90080/79/78/77 16-bit sensor AFEs or to order samples and an evaluation board, visit http://www.national.com/pf/LM/LMP90080.html.